Rani Khedira (Augsburg) spurned a good chance! He gets a shot away from inside the penalty box, but it goes inches wide of the right post. Bayer Leverkusen take a short corner instead of sending the ball into the penalty area. Marco Richter (Augsburg) gets a yellow card. Sergio Cordova (Augsburg) latches on to an accurate pass inside the box and immediately unleashes a shot towards goal, but it goes high over the crossbar. Manuel Baum decides to make a substitution. Francisco Caiuby will be replaced by Sergio Cordova (Augsburg). The manager makes a subsitution with Marco Richter (Augsburg) coming on for Andre Hahn. A long pass into the box is latched onto by Dong-Won Ji (Augsburg), who looks up and slams a terrific shot past the keeper but onto the crossbar. He did everything right but score! Karim Bellarabi (Bayer Leverkusen) takes the resulting free kick from outside the box. He sends a nice cross into the box, but his intention is well anticipated by the goalkeeper who comes out to collect the ball. Philipp Max (Augsburg) takes the corner which is cleared. Lucas Alario (Bayer Leverkusen) finds some space just outside the penalty area after exchanging the ball with his teammate and strikes a shot towards goal that goes inside the right post! That's the end of the game for Aranguiz, who is replaced by Lucas Alario (Bayer Leverkusen). Heiko Herrlich has decided to substitute Leon Bailey and he is replaced by Julian Brandt (Bayer Leverkusen). The whistle blows and Jeffrey Gouweleeuw (Augsburg) is booked for an infringement. Substitution. Jonathan Tah will be replaced by Wendell (Bayer Leverkusen). Here is a change. Alfred Finnbogason is going off and Manuel Baum gives the last tactical orders to Dong-Won Ji (Augsburg). One of the players from Bayer Leverkusen times his run too early and the referee blows his whistle for offside. Leon Bailey (Bayer Leverkusen) takes the corner but fails to find any of his teammates. The ball is easily cleared out of danger. That will be a yellow card for one of the players. The one who gets booked is Leon Bailey (Bayer Leverkusen). A thunderous effort from long range by Daniel Baier (Augsburg) goes well wide of the left post. Referee Bastian Dankert blows his whistle to start the second half. Lars Bender (Bayer Leverkusen) bangs the ball towards goal from the edge of the box, but it's rising all the way and sails high over the bar. Alfred Finnbogason (Augsburg) slaloms his way past challenges, but an opposing player does well to get the ball away. Leon Bailey (Bayer Leverkusen) takes the corner which is cleared by the opposition's defence. 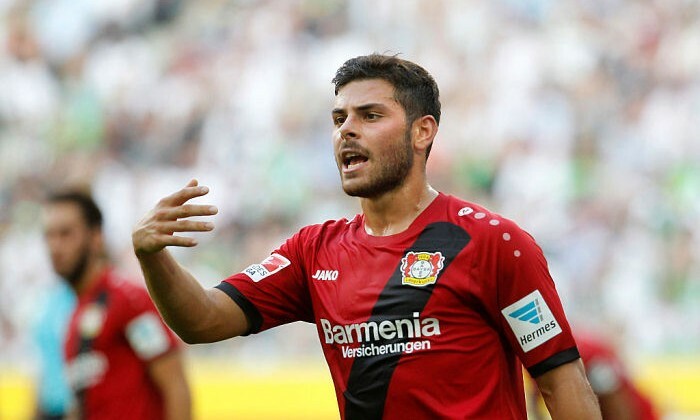 Bastian Dankert blows his whistle and it's Kevin Volland (Bayer Leverkusen) who is penalised for an offensive foul. Good decision by the referee. Aranguiz (Bayer Leverkusen) executes a nice mid-range free kick. His effort only flies inches wide of the left post. Today is obviously not his lucky day. Alfred Finnbogason (Augsburg) drives into the box and hits a tremendous shot that, unluckily for him, flashes just wide of the left post. Philipp Max (Augsburg) puts a cross into the box from the corner but there is no panic from the opposition and they easily clear. Kai Havertz (Bayer Leverkusen) wins the ball near the penalty spot and unleashes a header towards the right post, but Andreas Luthe is alert and denies him. Kai Havertz (Bayer Leverkusen) reacts well and displays good awareness inside the box to get on the end of the resulting corner kick. He fails to direct the ball into the net as it flies narrowly wide of the right post. Leon Bailey (Bayer Leverkusen) goes over to take a corner kick after one of the defenders makes a good clearance. Aranguiz (Bayer Leverkusen) shoots from the edge of the penalty area. The ball travels low towards the middle of the target, but Andreas Luthe easily deals with the threat. 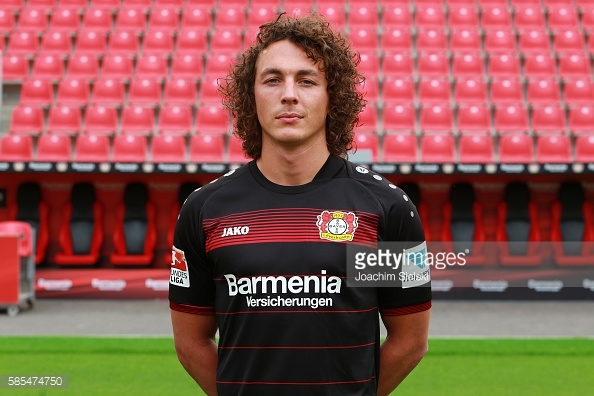 Julian Baumgartlinger (Bayer Leverkusen) unleashed a powerful long-range strike, but the ball was blocked by a defender on its way. Bastian Dankert was nominated as the referee for this game.